This amazing photo of the April 4, 2015 total lunar eclipse was captured by Dean Hooper in Melbourne, Australia and shared by the Virtual Telescope Project in Italy. In a total lunar eclipse this Sunday (Sept. 27), the surface of the moon will appear to be a deep crimson color, and people around the world will be able to watch the celestial spectacle online. The so-called supermoon lunar eclipse will be visible in most of North America, South America, Europe, Africa, western Asia and the eastern Pacific Ocean. But wherever you are, you can watch the eclipse live via a webcast by the Slooh Community Observatory. The Slooh broadcast begins at 8 p.m. EDT (midnight GMT), and will provide views of the eclipse from three different countries, including a stream of the eclipse rising over Stonehenge in England, as well as expert commentary. Slooh's tops the list of several live streams to see the lunar eclipse tonight by NASA, observatories and other skywatching groups. Lunar eclipses occur when the moon passes into Earth's shadow. 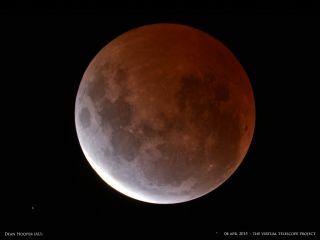 A moon in this position is often called a "blood moon" because the lunar surface is colored red during the event. This is caused by sunlight passing through Earth's atmosphere before it hits the moon's surface. This weekend's eclipse is particularly remarkable because it is also a supermoon, a full moon that takes place when the satellite is at its closest point to Earth in its orbit (also called perigee). A supermoon eclipse is a rare event: The last one took place in 1982, and the next one won't happen until 2033. There were only five total supermoon eclipses in the 20th century. In addition, Sunday's full moon is a Harvest Moon, meaning it is the closest full moon to the autumnal equinox. As a result, Slooh has dubbed the event a "Mega Harvest Moon Eclipse." The eclipse will begin when the tip of the moon enters the outer portion of the Earth's shadow, starting at about 8:11 p.m. EDT (0011 GMT). The moon will reach complete totality (it will be completely submerged in the darkest part of Earth's shadow) at about 10:47 p.m. EDT (0247 GMT). The eclipse will end at about 1:22 a.m. EDT (0522 GMT). Editor's note: If you snap a great photo of the supermoon total lunar eclipse tonight and want to share it for a possible story or gallery, send images and comments in to managing editor Tariq Malik at spacephotos@space.com.